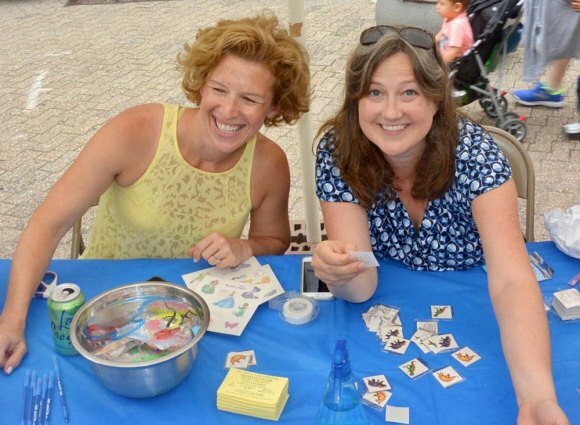 Briana Warsing (L) with Managing Editor Kelly Turner at Main Street WIRE table, Roosevelt Island Day 2017. 2019 started badly when I received a notice that Briana Warsing moved in State Supreme Court to collect on a default judgment against this writer and this newspaper for $300,000, claiming we did not respond to a Summons and Complaint served ten months earlier, on March 5th, 2018. We fought back. Updated, March 8th, 2019: After reviewing the Summons and Complaint, based solely on a sworn statement by Briana Warsing and filed against me personally and The Daily, we filed an Attorney Misconduct Grievance against Warsing's Attorney, Marc Jonas Block. On further review and consideration, we have filed a second grievance, this one against Warsing, who is a licensed attorney. Further action is not contemplated until a hearing on April 1st to consider Warsing's demand for a default judgment has taken place. We are seriously considering next steps, depending on the hearing's results. I hadn't heard from Warsing's attorney, Marc Jonas Block for well over a year, mistakenly assuming that Warsing was satisfied with holding me and The Daily up for public ridicule by presenting their legal complaint to the Roosevelt Islander blog for publication and going no further. Otherwise, I wondered, why had they never served the summons? But, according to Block, he had, on March 5th, 2018, although he was unable to produce any evidence and the only other person involved, a Manhattan Park concierge, said the Block was not being truthful. And if he did serve the summons in early March, starting the clock on a 20 day response limit, why wait 10 months before arguing that I didn't respond? During the more than 200 days that elapsed, the Main Street WIRE, under Warsing's watch, failed, going under after 40 years. A friend with some experience in these matters described that gambit as devious. A date of January 24th sat on the Supreme Court calendar to consider Warsing's motion. After doing my research, unable to afford a lawyer myself, I filed a "motion to oppose," explaining in detail that I was never served the summons. Instead of agreeing to let Warsing collect on the default, the judge reviewed both motions and delayed a decision until oral arguments can be heard on April 1st. Until Block notified us of his default motion, because I'd never been served the Summons and Complaint, I hadn't seen Warsing's allegations or Block's arguments supporting them. Once I had a chance to take a long look, I was alarmed. Very alarmed. My first impulse was to try to find a meeting ground. But again, my offer to meet, no strings attached, before things got uglier, was rebuffed by Block. He even shot back that my saying, were we not able to work things out like adults, face to face, I had no choice to defend myself with every tool at my disposal - was a threat. Since when is defending yourself a threat? Unable to make any headway toward a resolution with Block, I've filed a detailed grievance against him over what I believe are serious violations of professional rules of conduct in his handing of the lawsuit and related issues. Although Warsing, also an attorney, seems to have abandoned the profession a decade ago, I'm still considering a specific grievance against her. Updates will be posted as developments continue.